Yeah its the lack of being able to get him to shoot often that is the drawback on the advanced playmaker role. Put him on box to box and he didn't seem to get enough touches of the ball to really dictate things. What role is everyone using Pogba in? 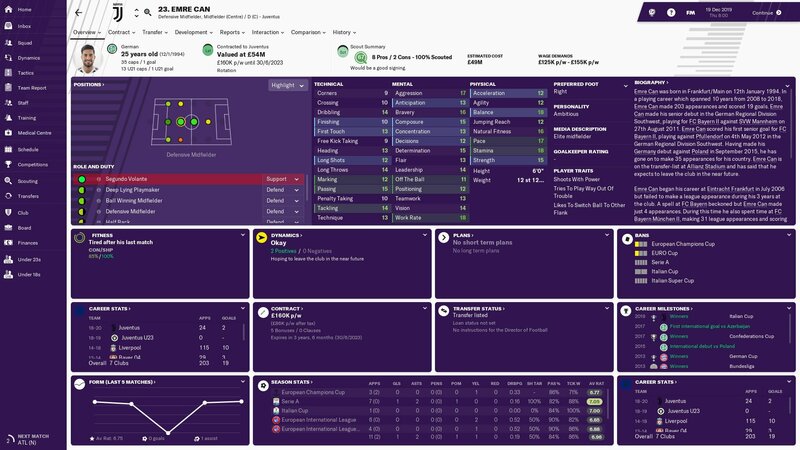 I'm using him in and Advance Playmaker Attack role on the left of a midfield 3, team is doing well but he isn't pulling up any trees in terms of individual performances. I have him as a B2B next to Herrera (who plays CM(D)) in my Gegenpress 4-2-3-1. Good for about 15 goals and 15 assists a season. I play a 4-2-3-1, and either use him as a Mezzala on support in the 2, or play him in the no10 role as an attacking mid on att. Doesn't get many assists, but scores quite a few. Me, I use a modified tiki taka 4-1-4-1. Got the usual suspects outlined earlier in this thread (De Ligt, Tiernay) as well as offloading expendables. 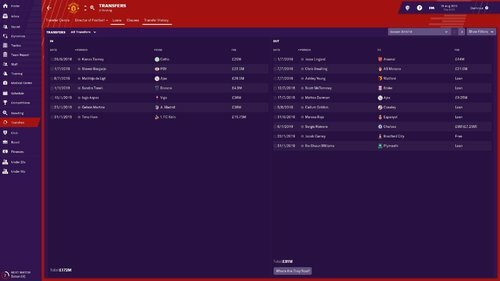 Took everyone's advice and offered Lingard out, Arsenal stumped up the cash, easy peasy! 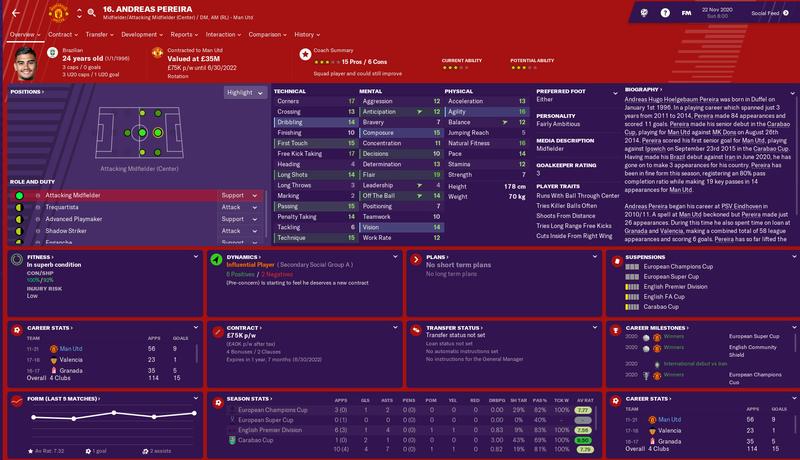 Bergwijn is a young right winger with plenty of promise who I thought would slot straight in at right winger, but he still had a ways to go, so instead I was swapping between Sanchez, Mata and Bergwijn until January when I decided to buff up my attacking options with Aspas (AMRC, ST) and Martins (AMRL) as well as bringing in Timo Horn as a solid backup GK. 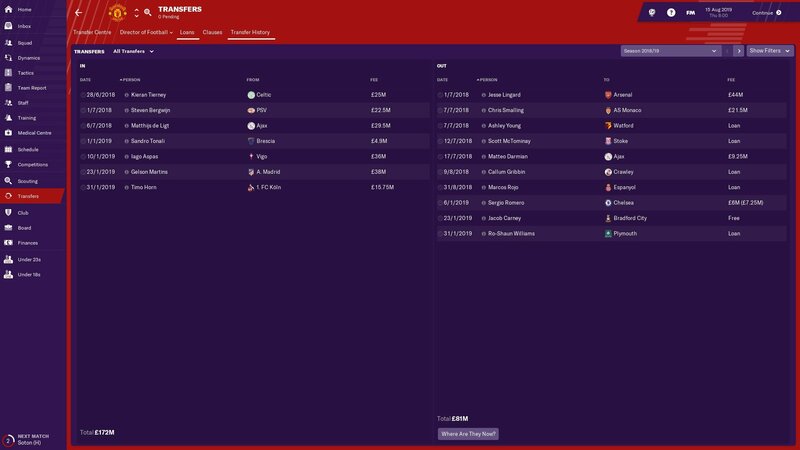 In terms of outgoings, Smalling was the only successful sell so i had to run down Fellaini and Young's contracts, and they left in the summer. The first things I did in my early days at United were giving De Gea and Martial their new contracts. I don't want to lose De Dea at any price. For Right Back problem, I signed Kimmich from BM for 80m (expensive but it worths). I've given Andreas Pereira a chance and he's done too well against small teams with his set-piece. The problem is his stats are poor. But he's from the Academy so I don't want to sell him (or I don't need to). 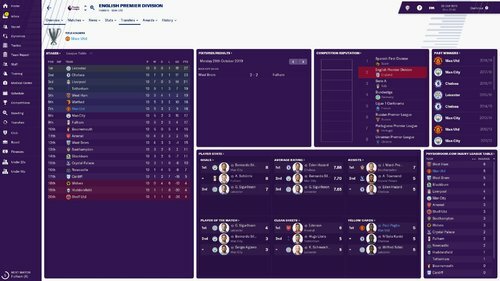 So I'm going into the 3rd season, will post an update later. But I've sold Lukaku to Madrid for 70 mil. I plan to use Rashford as my main striker. 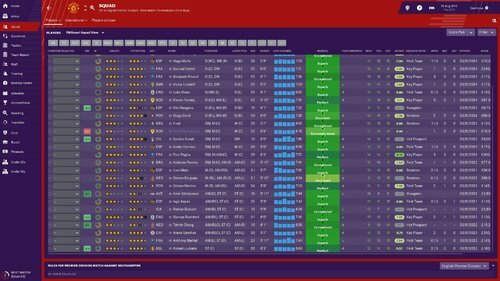 So am looking for a back up, was going to sign Belotti again, but struck a deal for Coutinho. 90mil and 400k a week in wages what do people reckon? If I bring him in, then Martial would be my back up striker. When I left it I had rotating full back pairings - Tierney / Dalot and Shaw / Semedo. 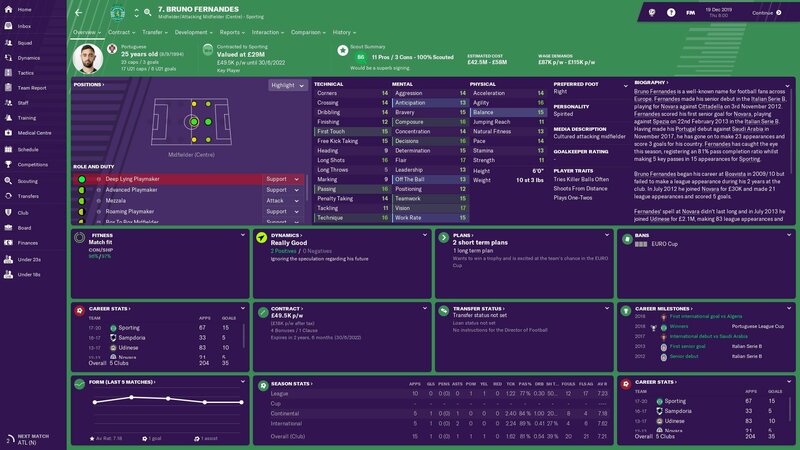 Got him same price, he's an absolute bargain for anyone playing relatively forward-thinking full backs. His long shots, in this ME? Hell yes. Yea 12 mil is a massive bargain, relatively cheap on wages as well. Yea should score a few, I didn't even think about his long shots on the ME. Just looked at it as have Rashford, Coutinho and Leon Bailey as my front 3, which would be an extremely good front line. 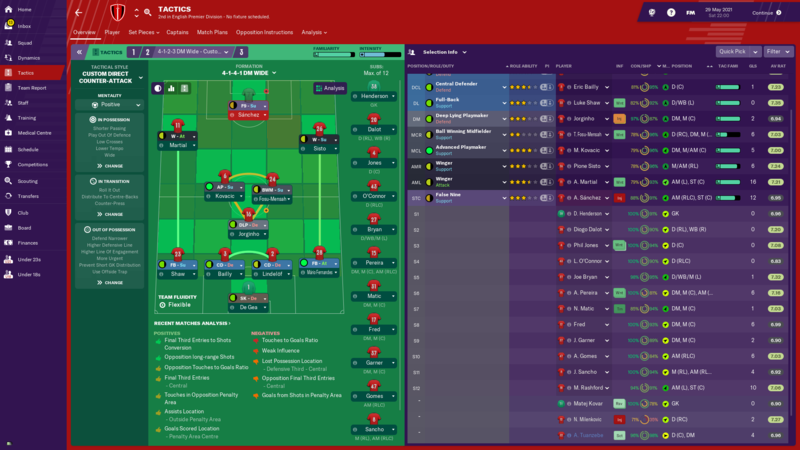 Plus finding a quality striker that I can use as back up to Rashford is abit tricky, Belotti was my 1st choice and have used him before, but kind of wanted to use someone different. What's Greenwood doing at the moment? 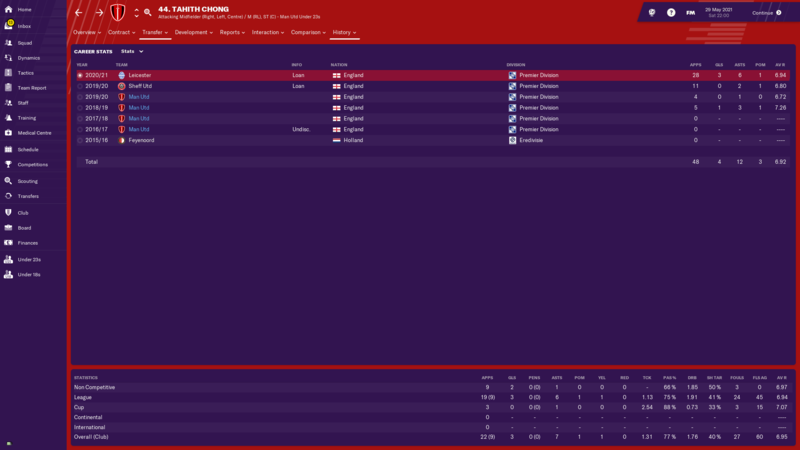 I had Martial - Lukaku as my 2 up top and Martial was immense, then when I left off midway through season 3 if was Martial-Rashford with Greenwood and Memphis as backups. Martial had 26, Rashford had 22. It was early January. 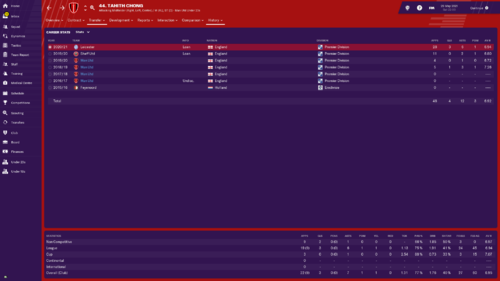 Sent Greenwood out on loan for 2nd half of 2nd season to Reading and did well. Now sent him on loan to Villa. 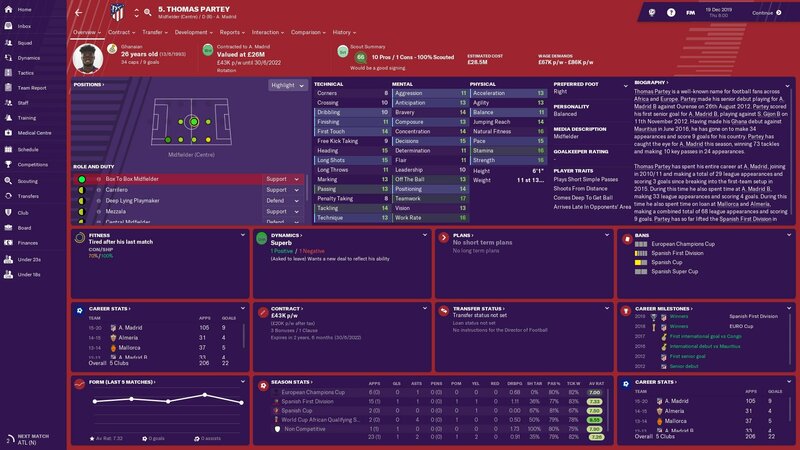 I then plan to use him in the 4th season, but is developing well. Does anybody else find Romelu Lukaku grumpy when you praise him? He’s on fire for me. Averaging 7.72, 27 goals from 25(9). He scored a hat-trick recently. I said well done you were lethal in front of goal and he said I don’t want to go over this again. Has happened a few times this season. Too much praise in a short amount of time irritates players. 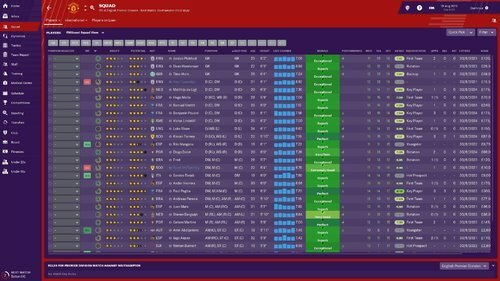 I've found the same issue with training praise, so I usually only praise training once per month (or if I criticised someone then next week they're top). Can Leicester do it again? Well I'm gonna try my best to make sure that doesn't happen, gonna be tough to catch up even at this stage! I've laid them out in my personal order of preference. 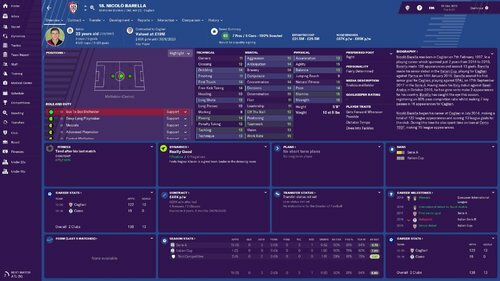 Can is transfer-listed and Barella looks to be an exciting young prospect, but I am curious as to what you all might think. Thank you in advance! @ShadowEdSide what roles are you using them in? Because that really shapes who you should buy. For example in my midfield with Pogba as BBM alongside a DLP-Su (Joao Felix or Saul) the lack of positioning in Fernandes and Barella wouldn't be a problem (Barella's get forward trait would be), but if you're playing a more defensive role then you need a more defensive player. @zlatanera DLP and BBM in support roles, does that affect the targets above? Gedson Fernandes from Benfica is an absolute beast in this years game and as @Garrlor above said Sandro Tonali is another beast.Buy these two players and your midfiels is sorted for the next ten years. If you have good finances/transfer budget then Saul is a great option. 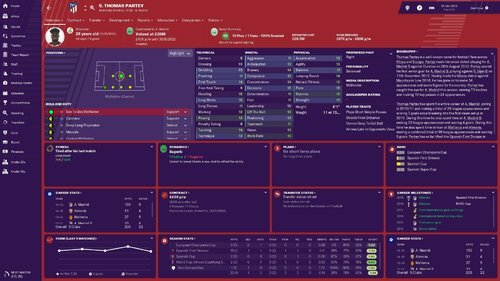 I brought in Leon Goretzka from Bayern, great BBM midfielder. Doesn't really play much for them from my experience, so shouldn't be too difficult to get. @ShadowEdSide Its funny what happened since your reply - my midfield duos are Pogba-Joao Felix (BBM-DLP) and Gedson Fernandes-Saul. He's definitely one of the best you can get. I had Kanté as a DLP for a while too, a leftover from when I played two Segundo Volantes. He's listed as preferring a BBM role but he has "Switches to Other Flank" and not great offensive stats so I'd say he's better in a holding role. 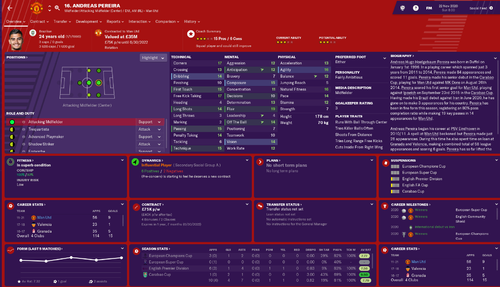 Goretzka was always proclaimed to be injury prone when I scouted him, but if he has decent Natural Fitness could be worth a gamble if he's squeezed out at Bayern - was immense for me on FM18. what have people done with Sanchez and when did you do such? I sold him after the 1st season, Bayern brought him for 45 mil, I did have to pay about 100k of his wages, but was happy to get rid really. 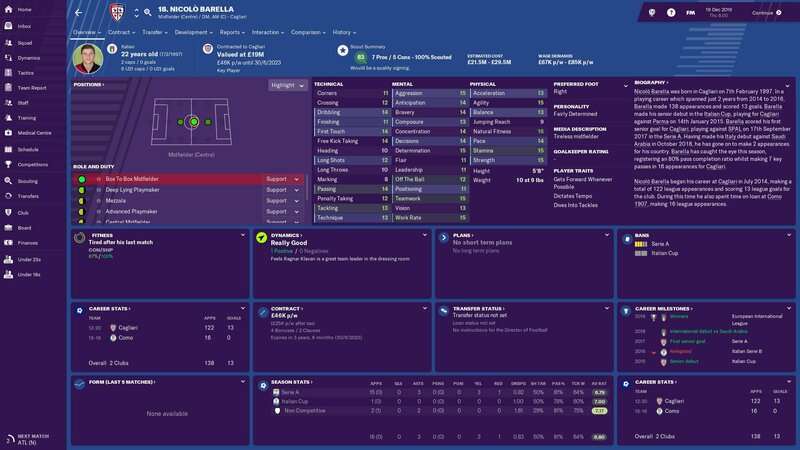 Got rid at the end of the 1st season on loan with a mandatory purchase fee and a loan fee (but had to pay quite a bit of his wages for the loan season) to Napoli of all people. 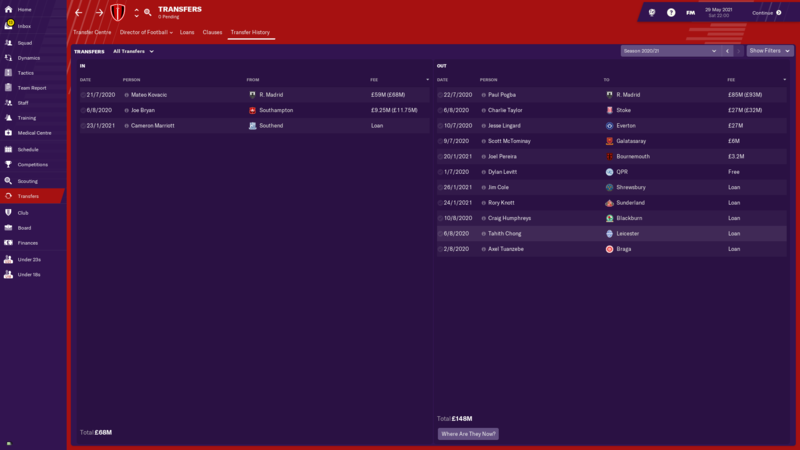 There's basically only two United players I've not been willing to give a chance since I started playing FM - Fellaini (his peculiar skillset just never fits how I want to play) and Sanchez as his transfer just seems like the worst possible outcome of both Woodward and Mourinho going full Woodward / full Mourinho - he was either signed entirely for his marketing value and for us to be seen to signing a big name (Woodward) or just to spite City (Mourinho - its funny when you're Chelsea manager poaching Willian from Spurs, less so when you're making a guy the highest paid player in the league and dropping an in-form attacker to make room for him) or both. Also he's been injury prone in both United saves I've had so far. I don't think any of the guys you've listed represent a significant improvement over Herrera and Fred tbh. I'd aim for Savic, Kondogbia or Kovacic if you're looking for a considerable step up. Maybe Lewis Cook as an English option? I'm three seasons in and Herrera's been rock solid for me. 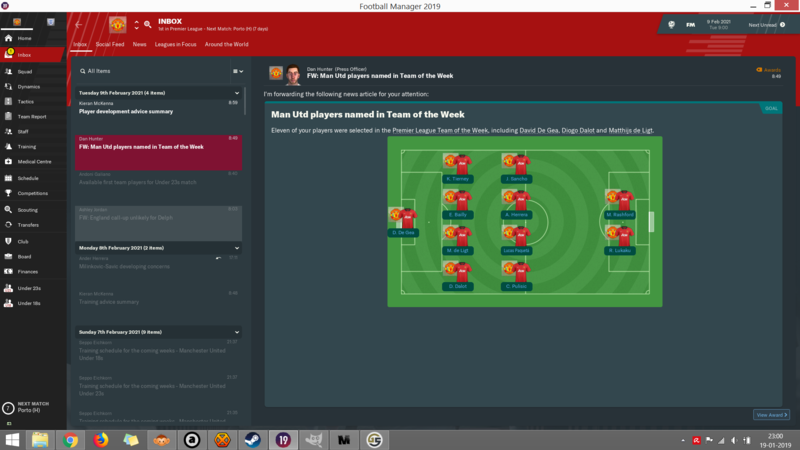 Fred's decent, but doesn't complain about first team football and can ably cover both Herrera and Pogba's roles (I'm now training Fred to play LB aswell ). 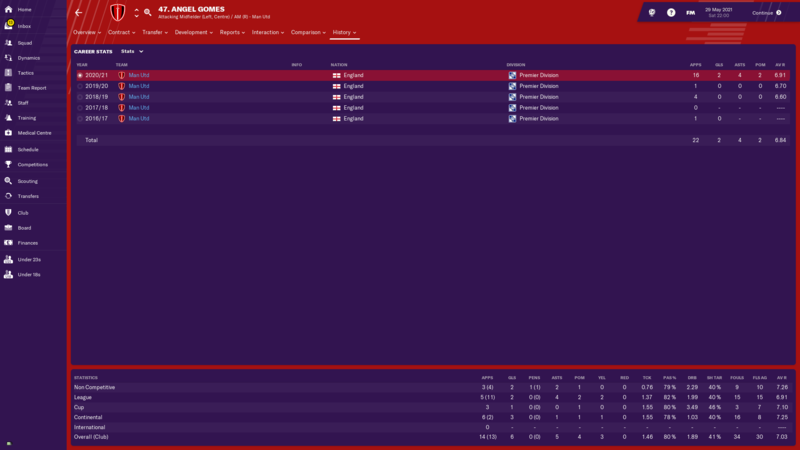 Sanchez is still with me, though I'll likely move him on after this season. He's listed by request as he doesn't consistently start over Rashford, Chong and Martial on my flanks. EDIT: Also Henderson's a really solid back up GK - hasn't let me down! 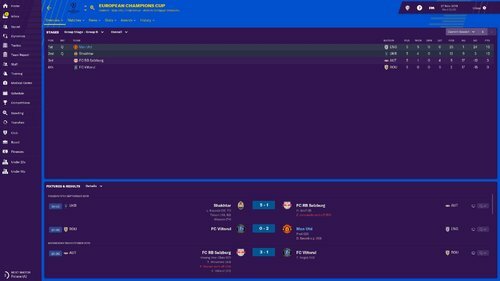 I am getting a little annoyed with my United save. I keep trying and trying to love this game, but get so frustrated at times. 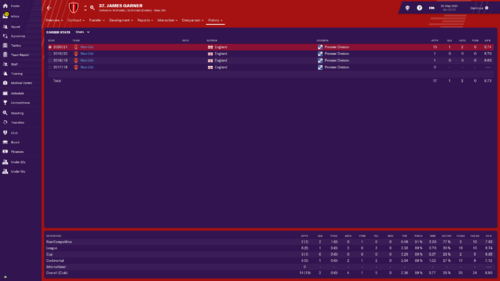 I have created more space than the big bang, but my fullbacks never attack it. Despite being a CWB on attack, Tierney or Shaw will stand and wait for the ball before bumbling forward to smack a cross into the fullbacks legs. Even better than that, with the hardcoded instructions for a CWB to run wider and hug the touchline, they will always without fail cut inside to where it is congested. I think I need to shelve my ideas for an attacking 4-1-2-2-1 and move to a 4-2-3-1 or a 4-4-2 of some description. 2 central attacking players needed to conquer this match engine methinks. 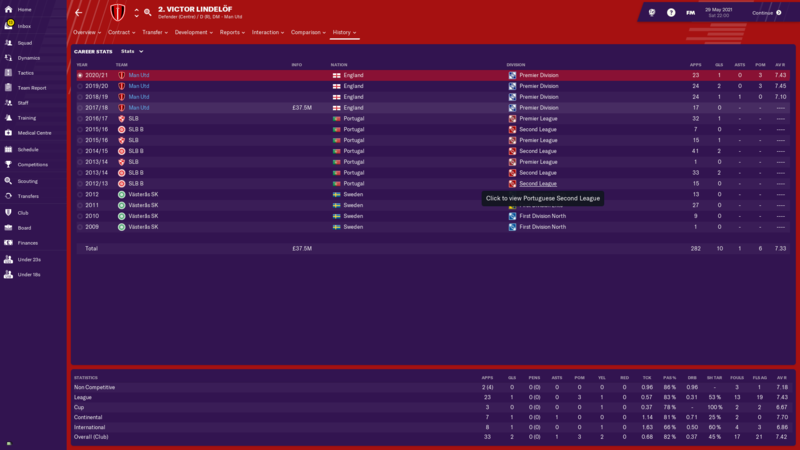 2 strikers is the only way to go for the Jose bus parkers that I am already facing in October of season 1. The only decent games I have played and enjoyed have been against Chelsea, Arsenal and Barca. Everything else has been mind numbing tedium of the highest order. After reading this i'm crying at this quote, jesus was so unprepared for this lol. On a serious note im with you for most of it. On attack you see more crosses with like 5-15% pulling off, support CWB is like a WB. 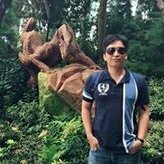 Cutting inside bug has been told but maybe they could do with more PM's and more analysis. What type are you trying to play? Mid section or central attacking is poor apparently and tbh I do agree cause using CAM's just look to go wide regardless of their role. 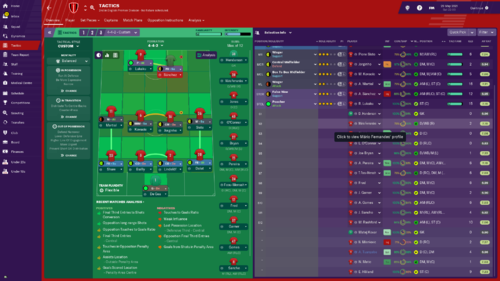 I play 4-3-3 and my inside forwards barely get anything done unless on support. cause of my wb do all the inside running leaving them stupidly wide and doing nothing useful. Tried going narrow and doesn't work. Season three at Manchester United has been the first one in which I've been a tad disappointed. We managed to retain the Champions League final, equalling Liverpool's record of five European Cup wins having beaten them 2-0 in the final, but for the first time in my managerial career I did not further manage to take the league title. What makes the pill even harder to swallow is the fact that it was our bitter rivals in the North West that claimed their 19th title, although to be fair we were competing with a side that achieved a staggering record points haul of 101! As can be seen, largely disappointing in all other competitions this season. 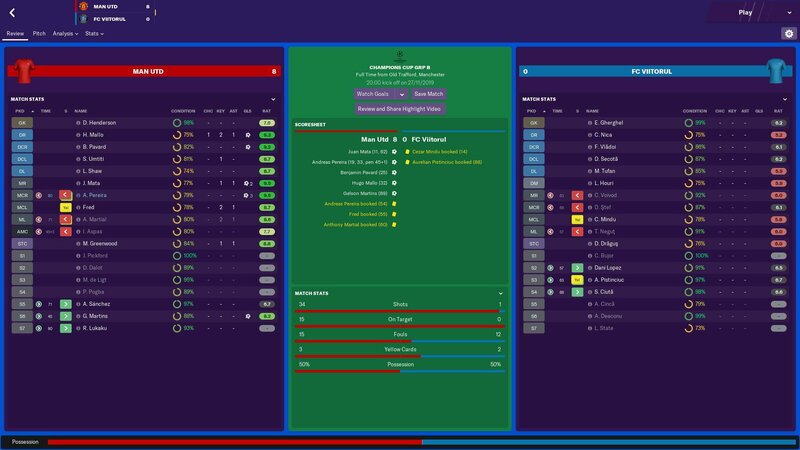 We dismally went out to Crewe Alexandra in the 3rd round of the FA Cup and lost to Manchester City in the fourth round of the Carabao Cup. 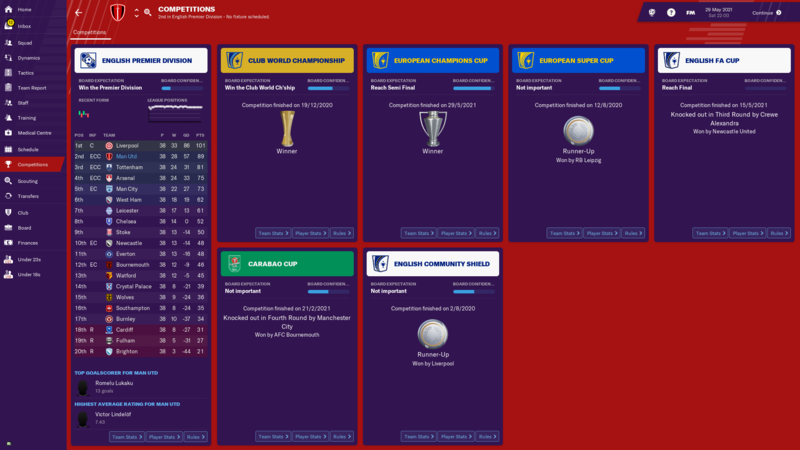 Whilst we did manage to win the Club World Championship fairly easily, we were also beaten in both the Community Shield and European Super Cup finals. Tactically, I changed my set-up for the smaller matches a little bit given the sale of Pogba and the fact that my 4-2-3-1 wasn't really working at the beginning of the season. I decided to switch to a 4-4-2 given the fact that Kovacic is marginally more dynamic than Pogba was. 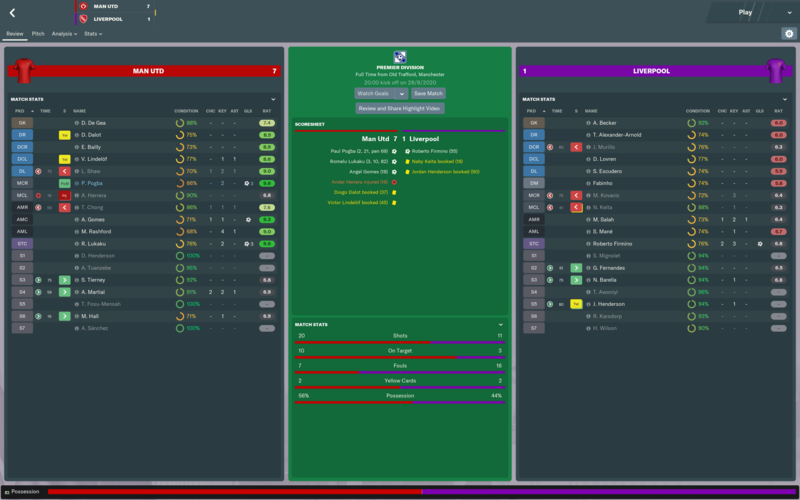 The results from this were mixed; I largely performed well against the small sides but there were a few hiccups such as an extremely disappointing 1-1 draw at home to Crystal Palace. 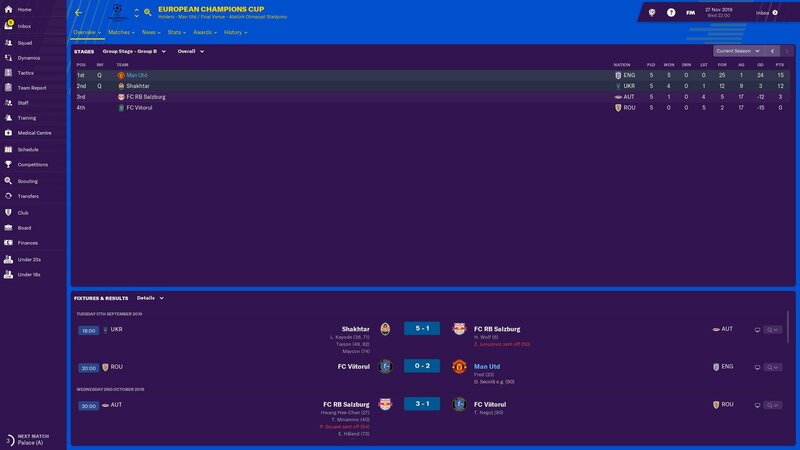 My tactics for big games did not change at all, which managed to see me retain the Champions League title but saw me take some disappointing away losses at Manchester City and Chelsea. 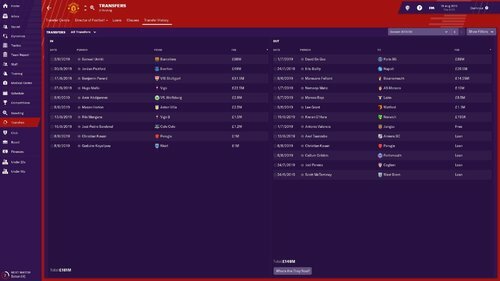 Transfer wise, I for the first time managed a negative net spend throughout the season, with the club's net spend standing at -£80M. 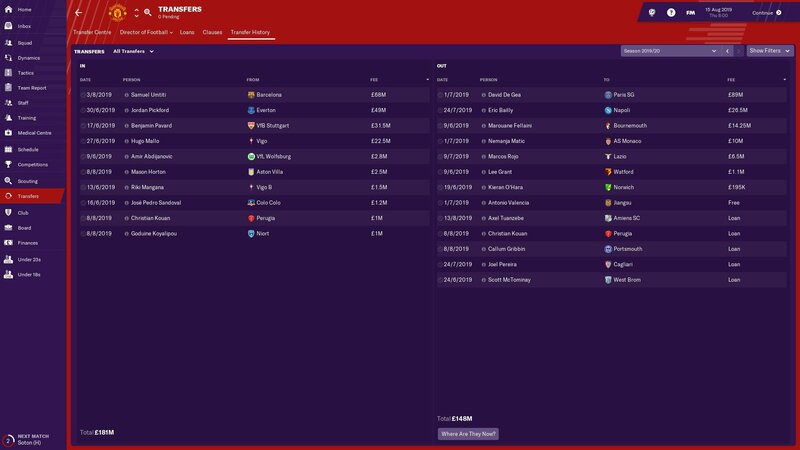 Unfortunately, this was largely due to the fact that I was unable to persuade Paul Pogba to stay at the club and he thus left for Real Madrid for a guaranteed £85M fee. 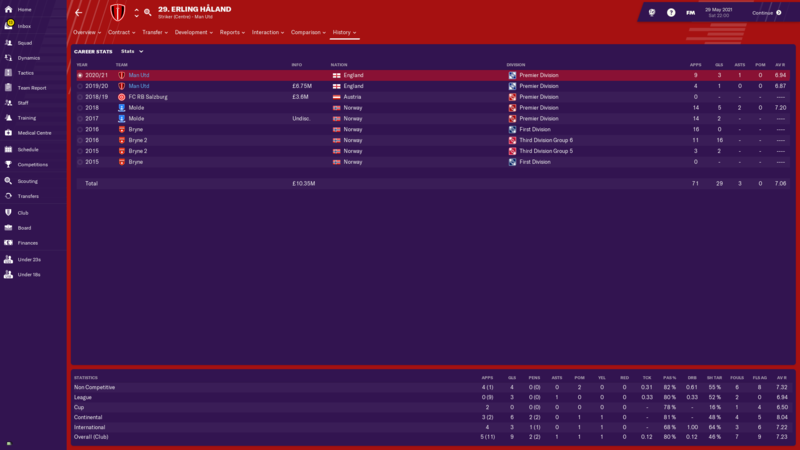 I was, however, extremely happy with the fee I received for Charlie Taylor; £27M from Stoke was far in excess of the amount I paid to sign him from Burnley. 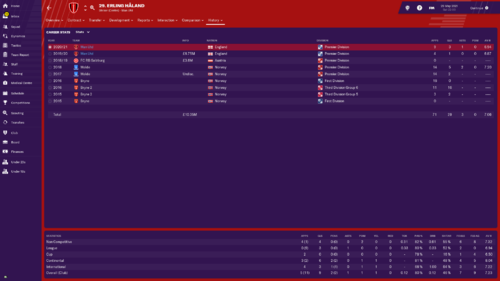 As far as my signings are concerned, both Mateo Kovacic (Pogba's replacement for the season) and Joe Bryan had respectable first seasons for the club. Neither were particularly outstanding, however, and this may well have been my worst season as far as incoming players are concerned. Probably my key performer this season was my new captain and defensive rock Victor Lindelof. With an average rating of 7.42 across all competitions having made 35 appearances, it's been another really great season for the Swede. Other strong performers for me this season have included Luke Shaw and Anthony Martial. Perhaps the most impressive thing about this season, however, has been the emergence of several of our young talents who have managed to get significant Premier League minutes for the first time. To emphasise this point, I shall focus on Tahith Chong (who spent the season on loan at Leicester), Angel Gomes, James Garner and Erling Haland. All four of these have been significant contributors to their respective teams this season, and I hope they continue to get minutes next season. 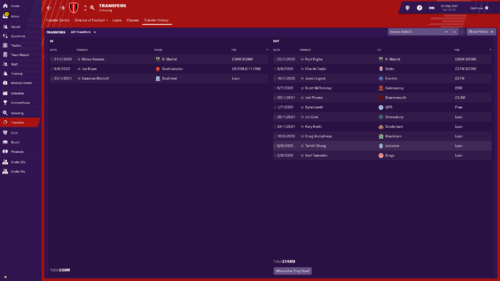 Going into next season, should I keep my job, I will likely make some significant tactical adjustments and plan to spend a fair bit revamping certain areas of the squad. In particular, I feel both Sanchez and Lukaku might need to be moved on and a striker would probably be signed to replace them. Meanwhile, I also hope to further bolster our creative midfield options. 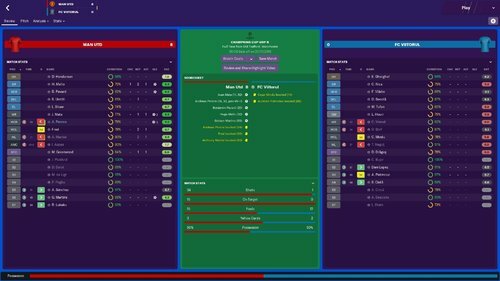 I’m not sure what it is but I have a terrible record against the big teams away from home. I mostly blow them away at home. 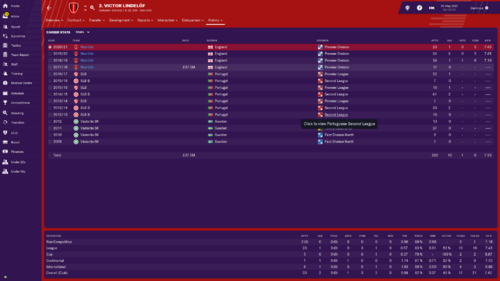 But struggling to get any kind of result away and it’s costing me the league. Some good points though... Pogba as a mezzala has hit 25 goals in both seasons I’ve played. Lingard has outshone all my other wingers and I have turned down £80 mil offers. I find all my other wingers/ inside forwards to be so inconsistent. Where have people got the best out of Rashford? I’ve tried him upfront on his own and from the left but he’s been very hit and miss. I played him as an inside forward on the left for the 1st season, but in the 2nd season and so far in the 3rd season he plays upfront on his own as an advanced forward. Been very good for me, and is my no1 striker. Chong especially develops really well, better than most of the other youngsters. 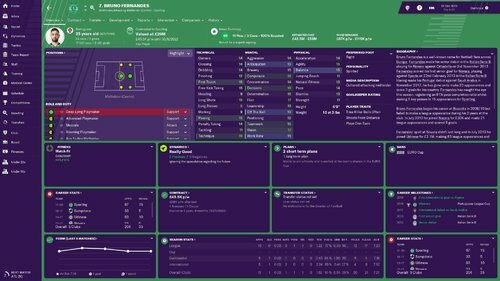 On my save he is doing well, all attributes going up. 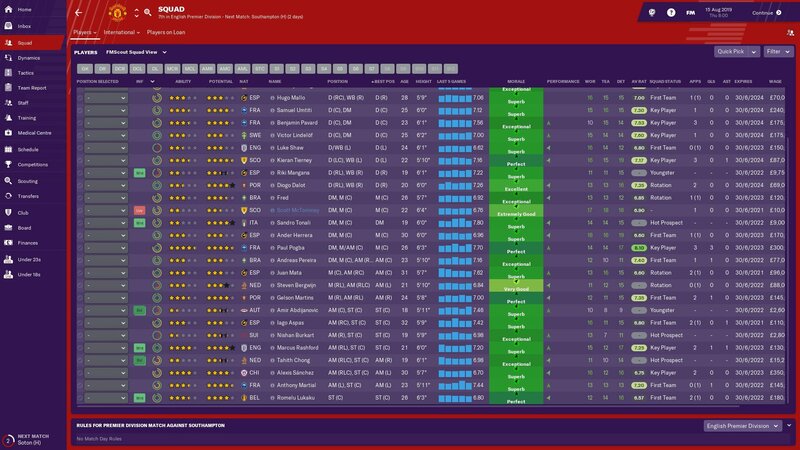 Also on my beta save with pompey, I did 6 seasons and the AI actually developed him really well and he was 1st teamer for the AI man utd. I play 2 formations, 4-2-3-1 and same as you a 4-3-3 but I use my inside forwards on attack instead of support, and that position is usually my best player. Whoever I play there usually, Leon Bailey, Martial or Rashford. I plan to have him alongside Sancho as a second choice winger next season, with Rashford moving up front alongside a new signing. 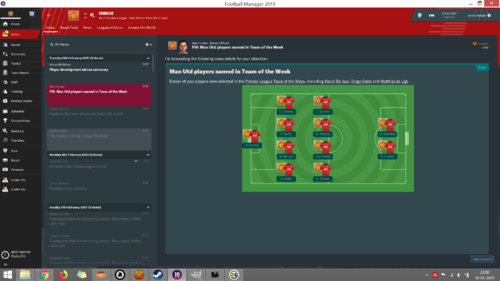 Chong's my starting RW over Martial and Sanchez, got me 15 goals from there in my second season. Him and Angel Gomes both turned out great for me! Okay one last question from me before I quieten down for a little bit...so at the moment my three team leaders according to my Squad Dynamics page are Sanchez, Herrera (Captain) and Pogba (Vice-Captain)...now as stated above, I'm planning on selling Herrera and most likely Sanchez in the summer, which will be two out of the three team leaders...should I be alarmed and perhaps worried that the squad will get upset, or will other players step up to fill the void at the top? You'll get complaints - but one of the options to reply is something like "others will step up" and that'll usually work out. Watch out for friendships though - De Gea doesn't like it when you sell Herrera, although I've usually gotten him to forget about it the past two FMs. I doubt Sanchez will have made friends, but check if he has. I've tried them on attack and they barely get involved into the game. For some reason sanchez is a complete hinder in my system although theoretically it should work. Martial was a hit and miss on attack but as support his dribbling goes from like 0.86 to like 4.65 on average which is very weird as I want him more or less near the box staying wide and driving in rather "in the final third". I'll try it when the ME is more useful for me. I did this and it was bad at the start. De gea and mata were really upset and were threatening to leave but the results and the constant of someone else wanting him quieted them down after 2 months. Bare in mind this was in the first ME update so it may change. Plus I quietly pushed sanchez out cause he weren't performing as only mctominay only backed him while martial, pogba and shaw all were against him starting games. Herrera is your biggest problem i'd say but i'd keep him around as back up just incase- do a mourinho on rooney type thing and ease him out or run his contract out. I'd never sell De Gea, but I don't judge. Just check with Sanchez - sometimes you get a player favouring a higher-profile player whilst the high-profile guy doesn't acknowledge him as anything special. Mata is very professional, he should calm down easily enough with the talk I suggested. Above comment about demoting him to backup and letting him run down his contract is a good shout - if they're over 30 there's an option under Interaction -> Warn Player where you can reduce squad status and then they don't complain about missing games as easily.